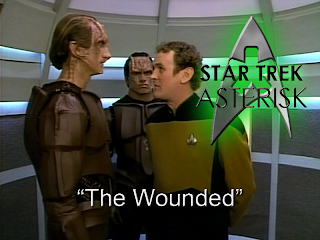 Star Trek: Asterisk "The Wounded"
Mere days after getting married, Miles O'Brien has to make nice with one of his sworn enemies; the Spoonheads. What does the Enterprise do on off days? Does it have off days? Well, no, not really, but when it anticipates off days, it goes and does mapping surveys along enemy borders. This particular enemy is the Cardassians. The Federation was at war with the Cardassians for a while, but they're in a peace treaty at the moment. Although, you wouldn't know it from the Cardassian ship that fires upon the Enterprise out of nowhere... The captain of the Cardassian ship says that he's firing in retaliation for another Federation ship that's been going around killing off Cardassians! The U.S.S. Phoenix destroyed one of their scientific bases! This is preposterous because everyone knows the Federation is good buddies with the people they form treaties with... right? Nevertheless, they go investigate this Cardassian's claims. This isn't the first time Picard faced the Cardassians, after all... and it won't be the last. As a gesture of goodwill, Picard invites the Cardassian captain onto the Enterprise to join closely with their investigation. This troubles O'Brien. 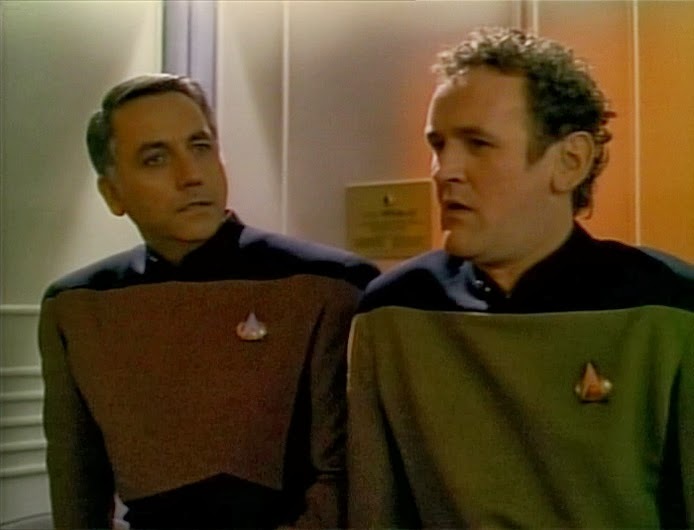 You see, the particular Federation captain they're heading out to investigate is Captain Maxwell, O'Brien's former first officer, and while under Maxwell's command, O'Brien watched as the Cardassian militia slaughtered a Federation settlement including Maxwell's family. But, oh, no there's no way he could be out for vengeance or anything. "Whachu say 'bout my captain?" While the Cardassians are on board, O'Brien is expected to show them around and give them as much information as they need to help in the investigation while they head toward Maxwell's last known location. As a kind gesture, one of the Cardassians invites him to enjoy some relaxation time in 10-Forward with them. 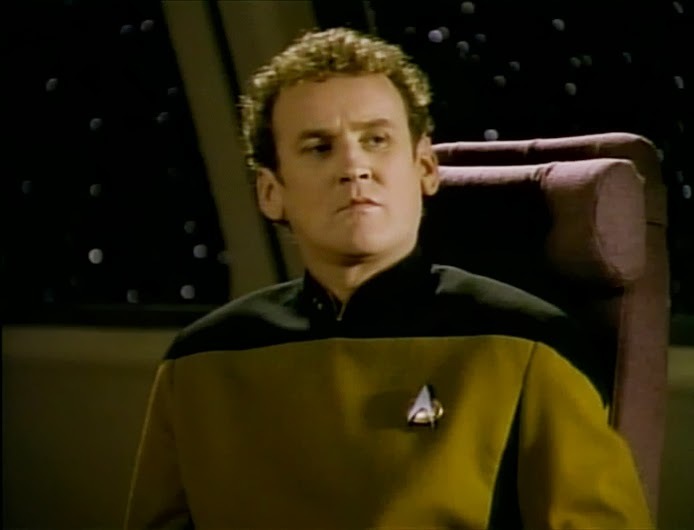 O'Brien refuses. And it totally has nothing to do with racism or anything. Freaking spoonhead. Well, the Enterprise eventually finds Maxwell on the U.S.S. Phoenix and heads towards it. It is heading toward a Cardassian supply ship. A defenseless Cardassian supply ship. The Cardassian captain insists that Picard allow him to send a closer Cardassian ship to intercept the Phoenix. Picard does not like that idea. He withholds the coordinates from the Cardassians as long as possible, but Maxwell is not answering hails and will not turn away from his course. 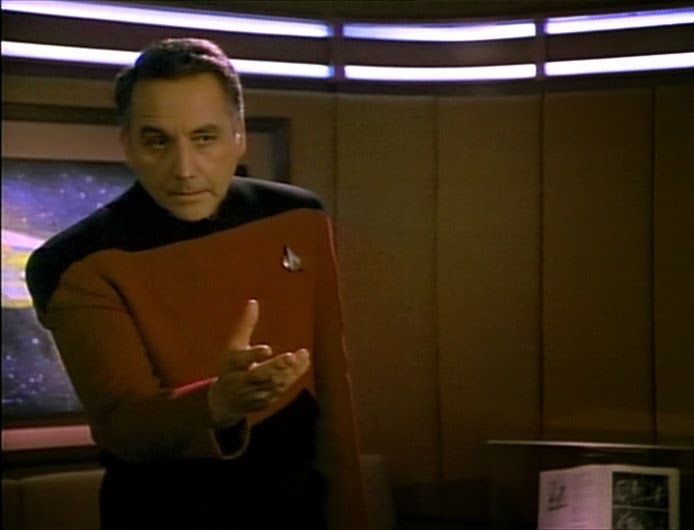 He could destroy the innocent supply ship... so Picard eventually gives in and hands over the coordinates. The closer Cardassian ships head toward the Phoenix... The Phoenix destroys them and cripples the supply ship. 600 more Cardassian lives lost at Federation hands. It didn't stop Maxwell, but it slowed him down long enough for the Enterprise to catch up. They intercept him and he beams aboard to explain his actions in person. "Before you say I killing spoonheads, let me splain u a thing." Maxwell says that he believes the Cardassians are setting up to strike at the Federation. The science base that he already destroyed was in a stupid place for a science base, but was highly strategic for a military base. The supply ships that were going in and out of it were blocking scans, leading him to believe weapons and military supplies were being shipped rather than scientific supplies. Of course, he has no proof of any of this, but the damn spoonheads have to be stopped! Of course, no one really believes him, so Picard gives him a choice: either retain his dignity, go back to the Phoenix and pilot it back to Federation territory himself; or be put in the brig and have the Enterprise drag the Phoenix along. Naturally, Maxwell chooses to retain his dignity. And just like that, Captain Maxwell diverged from the course and heads straight for another Cardassian supply ship that he insists is carrying weapons. The Cardassian captain denies it, but he won't let a Federation officer check it out, so Maxwell just keeps on going. Picard finally threatens to fire weapons on the Phoenix, Maxwell stops, and they're at a stand-off. During the stand-off, Transporter Chief Miles O'Brien has a brilliant plan to transport over to the Phoenix and talk his former captain down. He does so by using his engineering skills to get past the shields and then starts singing an old war song with his good buddy. Call Broadway! They're ready for the big time! 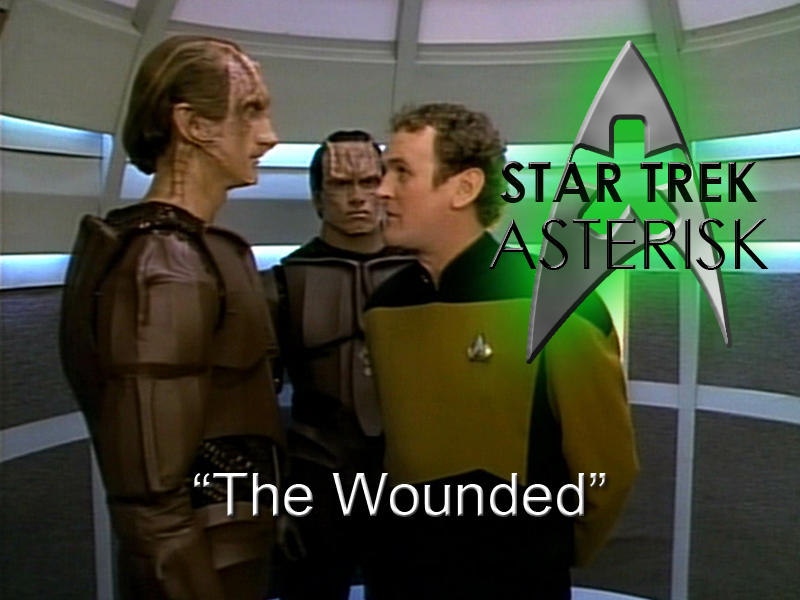 O'Brien convinces Maxwell to calm down and let go of his hatred for Cardassians. And O'Brien realizes this is a lesson he has to learn for himself, too. The two friends return to the Enterprise and everyone heads back to Federation territory. But Picard issues a stern warning to the Cardassian captain: Every argument that Maxwell made was valid, however erroneous his actions may have been to prove it. The actions that Picard took that day were to keep the peace, but he has one message for the Gul to take back to his superiors: "We'll be watching." Pretty sweet to see the Cardassians for the first time in this story. Already we know that they're not to be trusted and that they can be a relentless, cruel bunch. We'll see exactly how cruel later, but for now it's cool to look into O'Brien's background and stop another Ahab from hunting his whale. There seems to be a lot of those in Starfleet, doesn't there? If only those highly evolved humans could learn to accept other species for who they are!